I'm attending the Vancouver International Film Festival, featuring over 350 films over 16 days. I'll be seeing less than a dozen of these films, and I'll record my reviews and reflections here. Winter Sleep (Nuri Bilge Ceylan). The winner of the Palme d'Or at the Cannes Film Festival earlier this year, Winter Sleep is an intimate familial drama centered around one man's relationship with his wife, his sister, and the small community where he holds significant influence. This man, Aydin, is a former actor who runs a small hotel in the mountainous region of Anatolia in Turkey. The community is quite literally in the hills--homes and rooms are carved into the rocks like ancient cave dwellings, yet Aydin's hotel is equipped with modern comforts. It was strange to see the anachronism of Aydin typing away at his Apple Macbook inside his rocky grotto of a study that looks like something out of Middle Earth. Winter Sleep centers on the dynamics of separations--class, family, and marriage. Aydin is a wealthy man in his tiny community, and his indifference to the lower class and their plights are met with his amusement. A young boy throws a rock at Aydin's jeep, causing an awkward confrontation between the boy's father and Aydin's steward. The boy and his family rent a home from Aydin, and the rent has been due for months, causing an underlying tension based on finances and class divisions. While Aydin is typing out op-ed articles on his Macbook on how to make society a better place, this family wallows in the mud of his property. There's a disconnect here; Aydin spouts his ideals about spirituality, charitable giving in his writings, yet he rarely seems to practice what he preaches. Aydin is also at odds with his sister, Necla, a recently divorced woman whose strong opinions are often in conflict with Aydin. They have long dialogues about religion, marriage, and their own personalities, typically ending with some type of argument. Necla has a penchant for pushing buttons, even with Aydin's wife, her only companion in the hotel. The most complex relationship in Winter Sleep is the marriage between Aydin and his young wife Nihal, a beautiful and intelligent woman with her own sense of philanthropic ideals. Those ideals differ from her husband, and while he seems to want to support her, she keeps him at a distance, annoyed with his interference in her life. There has been an underlying tension building over years between this couple, a sense of bitterness from Nihal for being trapped in the cold, hard environment Aydin has fashioned in the Turkish hills. There is a parallel here between Nihal and the wild horse Aydin procures and keeps in a stable for the sake of his hotel patrons. Aydin controls and keeps things the way he wants them, seemingly oblivious to others' desires or aspirations. His idea of freedom and philanthropy doesn't match with Nihal's, who goes so far as to invite him to leave his own home while she conducts meetings to help the schools of their village. It might even be appropriate to call Winter Sleep a "marriage movie," as the relationship between Aydin and Nihal is of primary importance to the whole. Winter Sleep is a mixture of long, elaborate conversations with scatterings of beautiful scenes of the Turkish countryside. There were a few moments where I felt the three hour running time, but those were have been due to my semi-cramped seating in the theatre and not the mesmerizing character study portrayed on the screen. It's a subtle film, full of complexity and intriguing characters that never feel stilted; they feel wholly human, beautiful and flawed, navigating a winter season together-yet-apart in the crags of the steppe. Leviathan (Andrey Zvyagintsev). When I told my father that I was seeing a Russian film based on the book of Job, he told me, "oh, that sounds depressing and sad." He was right. Leviathan is a bleak and cynical indictment of the major social systems in Russian culture. From politics to religion to marriage to parenting to friendship, every form of system is dismantled and critiqued, revealing the hypocritical and ugly sides of all parties, leaving no one unscathed. The film centers on a conflict between Nikolai and the mayor of the small town on the edge of the Barents Sea in northern Russia. A mechanic by trade, Nikolai lives in the ramshackle home with his second wife, Lilya, and his teenage son, Romka. The mayor wants to evict Nikolai and take the land, but Nikolai has some outside help--an old army buddy, Dmitri, has come into town from Moscow with some compelling evidence to change the mayor's mind. Yet what begins as a simple land dispute and legal battle begins a spiral of circumstances leading to violence, infidelity, and the splintering of relationships. I went into the film expecting more overt spiritual themes, as the film had been described as a modern retelling of Job. Yet apart from the titular beast described in Job chapter 41 cited by the village priest in an argument with Nikolai, I would never have thought of Job. Job is described as a righteous man, and the injustice done to him was never due to his own behavior or lack of faithfulness to God. Nikolai is an impulsive and passionate man, prone to outbursts and heavy drinking. He never addresses God, apart from a drunken prayer asking why these terrible things are happening to him. In fact, none of the characters are truly righteous from a holy or pure standpoint. God is strikingly absent from Leviathan; the religious elite are either corrupt or unable to offer empathy or support to Nikolai and his family in their time of need. Where the book of Job ends with God arriving in his sovereign power and gracious compassion, God never speaks here, and the film is certainly a tragedy. Perhaps better biblical parallels would be Ecclesiastes or Lamentations, books which mine the depths of grief and existential crisis. 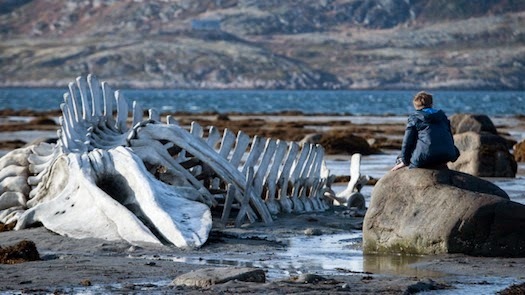 Leviathan is well-crafted, beautifully shot, ambitious, and quietly compelling, but its despair was too overwhelming for this viewer to find it worth revisiting. Class Enemy (Rok Bicek). When the favorite teacher of a classroom of high school seniors goes on maternity leave, their new harsh substitute teacher, Robert, quickly finds himself antagonized and the focus of a a growing rebellion. Rigid and authoritative, Robert singles out students and shames them, particularly a sensitive and quiet girl named Sabine. When Sabine goes home and commits suicide after a harsh conversation with Robert, the rest of the grieving class place the blame on the teacher. What makes Class Enemy so fascinating and why it works so well is its ability to navigate the realms of the morally grey with apparent ease. Even the color palette is stark, using natural grey lighting from Slovenia to give a pale and monotone look to the film. At first, I felt sympathetic to the students and their desire for justice; Robert felt like a monster of a teacher, aloof and cruel in his methods, and the students lashing out was reasonable. Yet as the mob mentality began to grow and the students became more vocal and belligerent, it was difficult to find a true protagonist, and I found myself wishing the students would give up on their tirade. As the rebellion escalates, the entire situation feels both exaggerated and authentic; I could see a similar situation playing out in a local high school, particularly surrounding a suicide. Even Sabine is difficult to pin down; her own best friend doesn't know her particularly well, and she's portrayed both as saintly and selfish. I almost wish Class Enemy played out more like 12 Angry Men or similar morally complex films, staging the entire story within the classroom itself, creating a claustrophobic tension. The strongest filmic parallel--perhaps Class Enemy's brighter twin--is Monsiur Lazhar, a wonderful Canadian film about a substitute teacher who helps a class of children process their grief together after the suicide of a beloved teacher. Both films address suicide, grief, and the impact of a teacher on a classroom. Yet while I found Monsiur Lazhar to be the more hopeful and affecting film, Class Enemy certainly made me think more, especially about what I would do in a similar situation. As a youth pastor and a cinephile, Class Enemy is right in my wheelhouse--a tense, relentless morality tale which kept me on my intellectual and philosophical toes for its entirety.